This was using pre-colored digital images, so great to not have to color some times. My daughter Emily likes to join my in challenges some times, this is one she did recently, she wanted her puppy to wiggle so she asked to use an Action Wobble. This is one of my very favorites, Love the soft colors. Don't forget about the current challenge, you can click here to check it out. 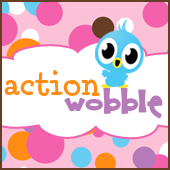 Don't have any action wobbles yet? (gasp) it's ok, you can click here and get you own. These are sooo cute and tell Emily Grace to keep up the good work, she's doing great!